Every supply chain has its own set of pain points. Although varied by industry and company size, these pain points often stem from inefficiencies and entropy, and are manifested as a result of either lack of attention or lack of process, both of which affect your supply chain optimization. It’s important to be thorough and break down each layer, process by process and person by person. It can be extremely helpful during this process to have the assistance of an experienced supply chain engineer. Supply chain or transportation network study – identifying pain points in your distribution and transportation networks, though intensive and often costly, allow you to reassess your entire supply chain and align it for success. Engaging a third party provider or supply chain consultant with engineering expertise, the right supply chain optimization tools, and an intimate understanding of your industry can help you properly optimize your supply chain to meet your most important supply chain goal – getting your product to your customers in the right time, at the right cost. Lean action workouts – a great way to identify low hanging opportunities for improvement, or deeply rooted issues within a warehouse, is to do a Lean action workout. These workouts focus on operational, safety and quality aspects within a distribution center. When done correctly, they have sustainable bottom line impact—and drive improvements in workplace culture. Learn more about Lean Action Workouts. Embrace technology – leveraging an advanced Warehouse Management System will allow your company to troubleshoot pain points with planning and forecasting by allowing you to better understand product cycles and therefore ensure your product flow is smooth, inventory costs are kept in check and space is used as efficiently as possible. Does my WMS allow me to forecast, plan and anticipate peak times of demand? Does my inventory and order management data give me real business intelligence? Do I have inventory visibility that helps me make decisions upstream and downstream in my supply chain? 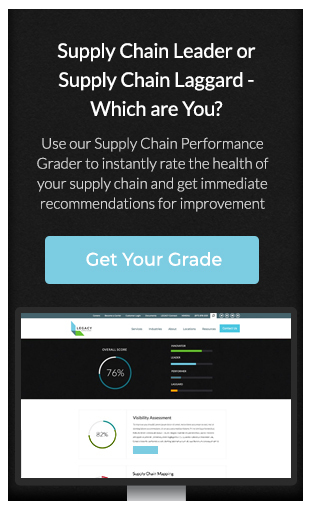 An underperforming WMS can cause serious damage to a supply chain, which is why we recommended a Tier 1 platform capable of providing better visibility and management of product inventory, as well as additional insight on warehouse labor, space utilization, workflows, equipment requirements and even accounting. Once you’ve conducted your study, done your Lean action workouts, or leveraged technology, now it’s time to IMPLEMENT with measurable action plans. To measure is to know, and without measurement, you cannot manage toward a successful supply chain. Operational metrics – measure how well a provider is handling the day-to-day within a distribution facility or transportation scenario. They can include order accuracy, inventory accuracy and lines picked per hour. Tactical metrics – measure a providers performance against Key Performance Indicators for the client. Tactical metrics can include things like order cycle time, or speed to shelf measurements in the retail industry. Strategic metrics – measure how well a 3PL and client are operating as partners. Is the supply chain driving value, and ultimately optimizing costs for the client? Is the client able to meet or exceed sales targets as a result of the relationship? These metrics should be visible and meaningful across a supply chain, and embraced by leadership. When company leaders live by these metrics, the culture becomes one where employees thrive on driving continuous improvement within the supply chain. Having a partner help identify and mitigate the many stressors you may be facing in your supply chain can be a competitive advantage to your business. 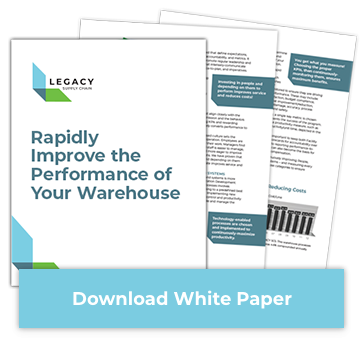 For more information specific to increasing your warehouse performance, download our white paper, Rapidly Improve the Performance of Your Warehouse. In this whitepaper, Rapidly Improve the Performance of Your Warehouse, you will learn about the three component areas a solution must address to achieve rapid performance improvement.